This salad is fresh and unassuming and is easy to adapt to bigger or smaller groups. It has a nice, warm sesame flavour and lots of great textures, and is dairy free. It’s a great potluck dish. This salad comes from my mother in law – my addition is the carrots – and we served this salad at our wedding because I love it that much. It goes nice with barbequed steaks. Like all my recipes, T is tablespoon and t is teaspoon. Chop cabbage and green onions. Combine cabbage and green onions with sesame seeds and almonds. 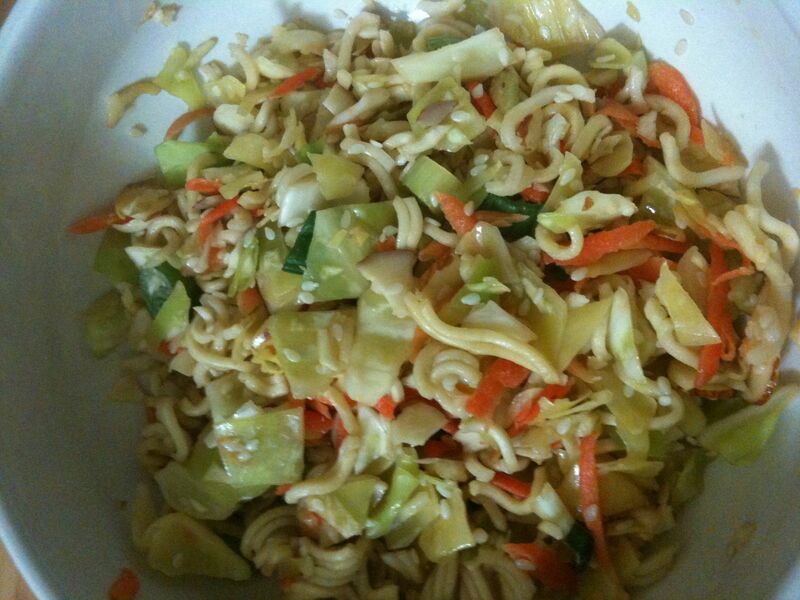 Break up raw ramen noodles into smaller pieces and add to the mix. Mix with dressing an hour before serving.